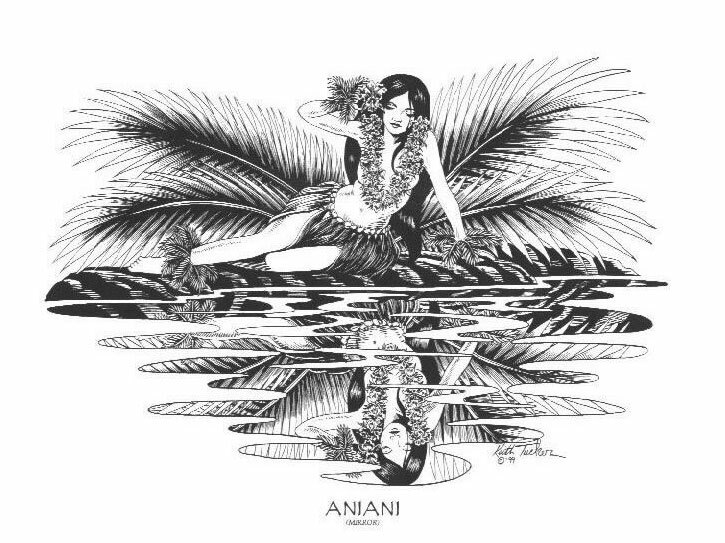 AND HELP SUPPORT THIS SITE AND KEEP ME DRAWING MORE POLYNESIAN ART. 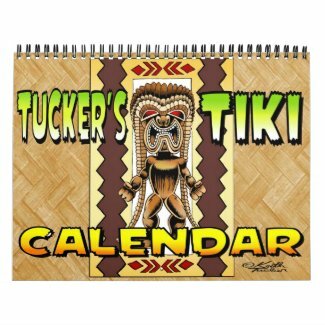 AND THERE'S ALSO MY TUCKER'S TIKI CALENDAR IS FULL OF TIKI'S! 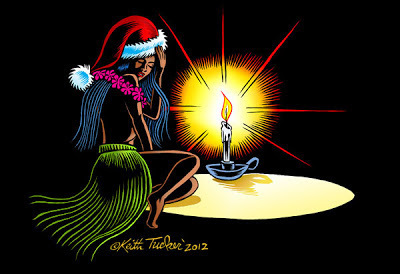 I"M FEELING A BIT SOMBER ABOUT THE CHILDREN AND GOOD PEOPLE WE LOST IN CONNECTICUT AND THE WORLD DUE TO ANGER AND CONFUSION THIS YEAR, PLEASE TAKE A MOMENT TO REMEMBER WE ARE ALL ONE PEOPLE, ON ONE PLANET, TOGETHER. 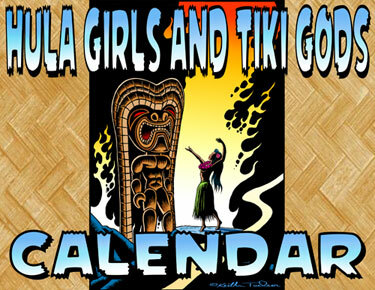 IT'S HERE, TWELVE MONTHS OF CRAZY TIKI ART, IN LIVING POLYNESIAN COLOR! 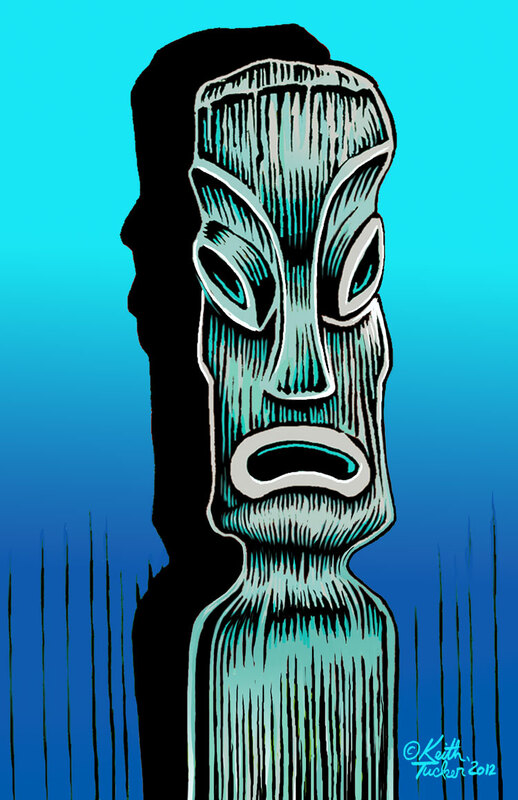 A GREAT OPPORTUNITY TO SUPPORT MY TIKI ART AND THIS WEBSITE! MY WIFE STARTED THE TRADITION OF THE FAMILY DANCING WITH THE TURKEY DECADES AGO. THEN WHEN THE KIDS GREW UP AND THEY ASKED THEIR FRIENDS WHEN WILL THEY BE DANCING WITH THE TURKEY BEFORE THEY COOKED IT? 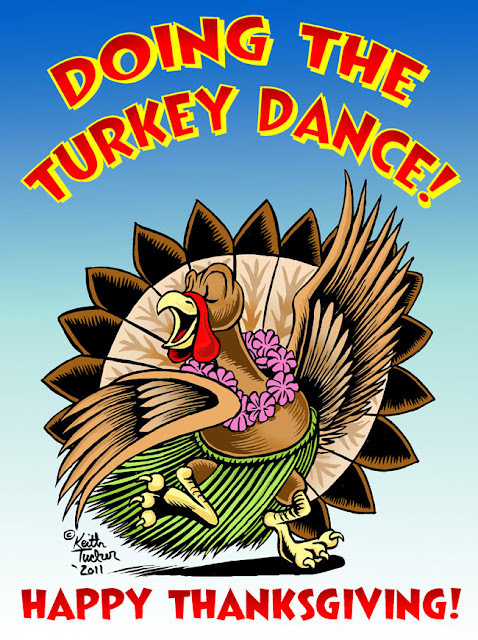 WELL THEIR FRIENDS HAD NEVER HEARD OF SUCH A THING, DANCING WITH THE TURKEY?!!. WELL THAT PROMPTED A PHONE CALL HOME TO LET THEIR MOM KNOW THAT DANCING WITH THE TURKEY IS NOTHING ANYBODY HAD EVER HEARD OF! 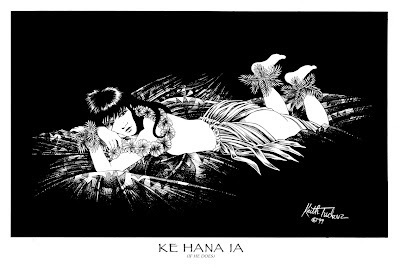 THE WAY I SEE IT IS THAT IT'S SIMPLY A WAY OF HONORING THE ANIMAL YOU ARE ABOUT TO EAT, A TRADITION AS OLD AS MANKIND ITSELF. THESE DAYS WE STILL DANCE WITH THE TURKEY AROUND OUR HOUSE.
" Move on down, move on down the road!" 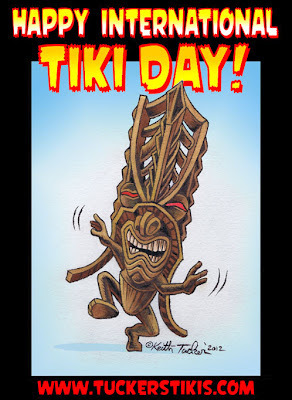 THE SECOND SATURDAY OF AUGUST IS CELEBRATED ACROSS THE GLOBE AS " INTERNATIONAL TIKI DAY"! SO BREAK OUT YOUR FINEST HAWAIIAN SHIRT, DUST OF THAT DR. WHO FEZ, RAISE A MAI TAI AND PROUDLY HAIL THIS FINE DAY OF TIKI CULTURE. 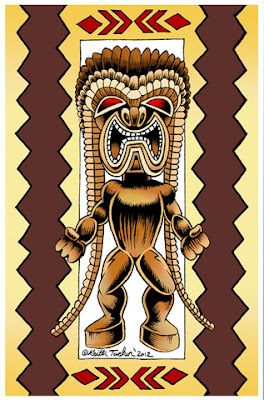 IT'S THE TIME TO CHEER THE POLYNESIAN TIKI GODS, WHEREVER YOU ARE IN THIS WORLD. 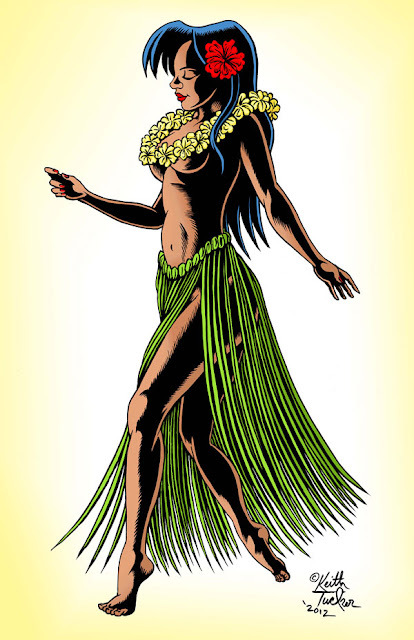 "lOVELY HULA DANCER", SHE DANCES IN THE MOONLIGHT AS THE GENTLE TRADE WINDS BLOW AND THE OCEAN WAVES CREST AND FALL ON THE HAWAIIAN SHORE. MY LATEST ART PRINT WAS A TOTAL PLEASURE TO DRAW. WASHINGTON ROOM AT THE RED LION HOTEL, ON HAYDEN ISLAND! NEW ORIGINAL ART AND PRINTS WILL BE ON DISPLAY FOR ALL TO PURCHASE. 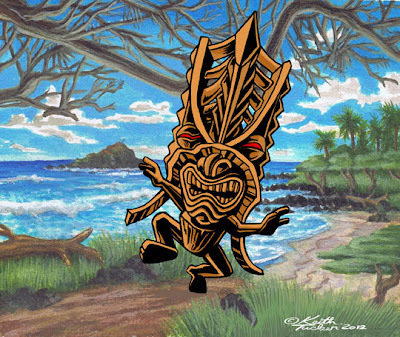 PRINTS OF MY LATEST TIKI, " STRONG AND HAPPY KU" ARE AVAILABLE NOW AT MY BONAZA PRINT SHOP, HELP SUPPORT THE ARTS AND GET A PICTURE FOR YOUR WALL, WHOO, WHOO. OR GET ONE DIRECT FROM ME AT THE NORTHWEST "TIKI KON" ON AUGUST 4th. 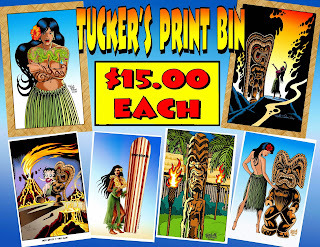 I'LL BE THERE WITH A BOOTH PACKED WITH ORIGINAL ART AND PRINTS! 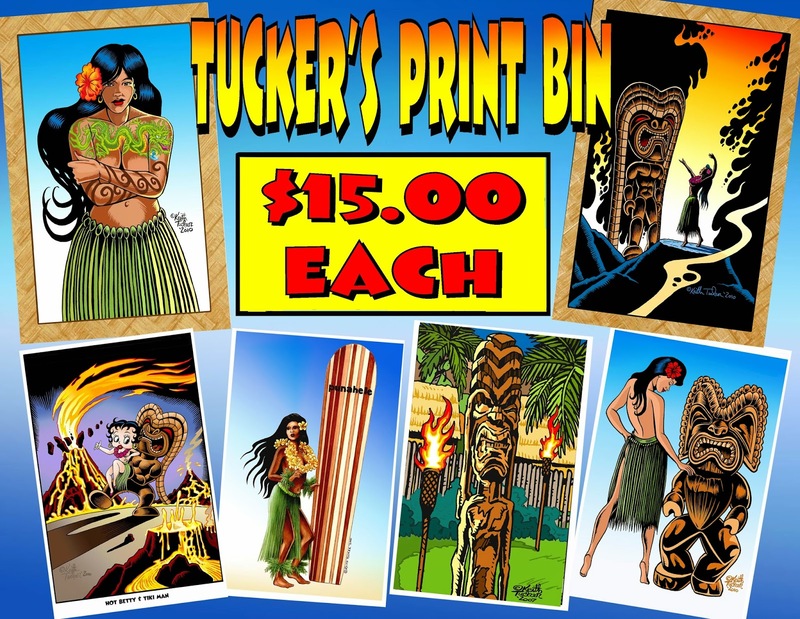 HEADS UP TUCKER'S TIKIS FANS, I"LL BE AT "TIKI KON"
AND ORIGINAL ARTWORK FOR SALE, I HOPE TO SEE YOU THERE. 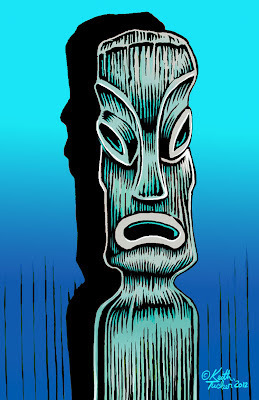 Imagine your living in ancient Polynesia, it's an average sunny day in paradise, the trade winds gently blowing, children play in the ocean as it crests and crashes on the shoreline.Thousands of birds chirping in the jungles, then suddenly all goes quiet, you hear a faint humming sound growing closer from high in the sky. You look up to see a saucer shaped craft flying through the sky, then hundreds more appear. 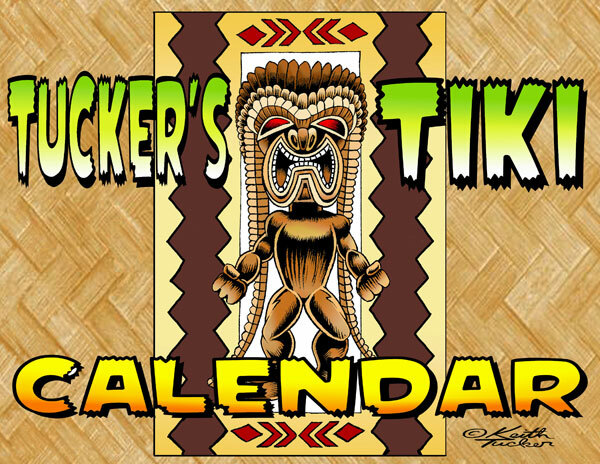 They land and out steps several Tiki's in space suits, and they begin to capture the native population, and you try your best to fight back against something you couldn't possibly understand, Ancient Alien Tiki's from outer space! 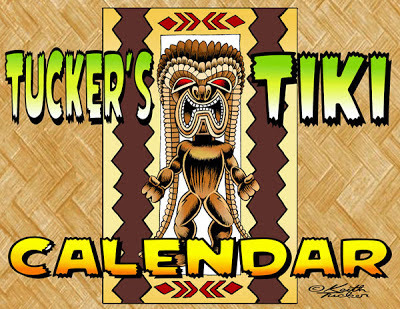 GO TO http://www.tikimagazine.com TO ORDER YOUR COPY! 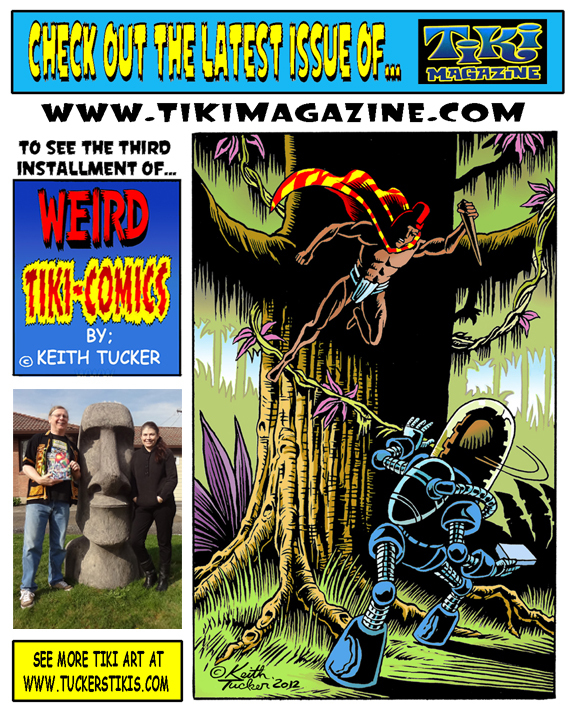 AND SEE THE LATEST INSTALLMENT OF KEITH TUCKER'S WEIRD TIKI COMICS! 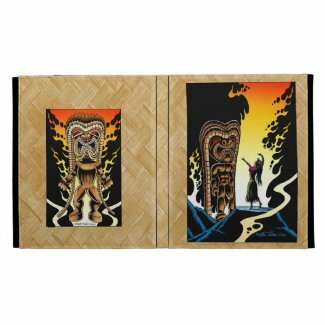 RETRO EC STYLE SCIENCE FICTION COMIC BOOK FUN!